Galle has a history dating back to the 14th century when Chinese frequented this port town. It was and still is one of the important ports for Sri Lanka. It has seen occupation by the Portuguese, Dutch and the British. Upon your arrival to this historic city, we will be at hand to greet you and help you check in at the Hotel Koggala beach. After your breakfast, we will take you on a guided tour of the city. 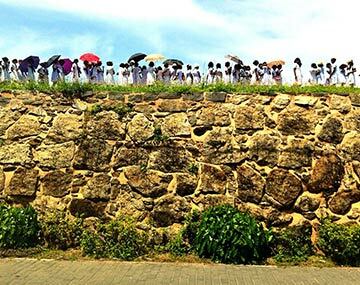 The tour begins with the Galle Dutch Fort, the oldest fort in Asia, named as a world heritage site by UNESCO. The fort houses the Dutch Museum, which contains artifacts of the Dutch Reformed Church. You can also stroll around the Maritime Museum in Galle. This day is yours to explore the panoramic views this small peninsula has to offer. But remember, your breakfast is with us. After your breakfast at the hotel we will take you to Bentota, where every view is that of a beach. After a short while relaxing, you can join us on the guided Bentota Tour. The golden sands here have the power to entice any person. We will take you on a boat jaunt on the River Madhu so that you can enjoy its soothing waves. A visit to the Turtle hatchery will leave you in wonder at the miracle of life. After an exhausting day, enjoy the comforts of the Hotel Marina Bentota. Soak in more of the sun at the beaches, as this day is yours to laze and relax. But be sure to taste the local flavours spread at our breakfast table. On this the last city in our itinerary, we take you to Colombo and help you check into the Hotel Berjaya Mount Royal. The largest city of this island nation, Colombo has a history and still is the commercial capital of Sri Lanka. The architecture and flavours bear witness to its settlers, The Dutch, The Portuguese and The British. The Hindu, Islamic, Buddhist and Christian worship places dotting the city testify to the religious tolerance of the Country. The guided city tour will ensure that you get a good look at this beautiful city. Galle Face Green, the Viharamahadevi Park, National Museum, Twin World Trade Center towers, Old Parliament Building, Fort district, Independence Hall at Independence Square and many sights will be visited. Colombo is also a shopper’s paradise. The local art, textiles and artifacts can be collected in the market. This is your day to explore the markets. With a heavy heart, we will bid adieu and wish you safe journey back home to India. Sri Lanka is an island nation bordered by three massive water bodies, the Arabian Sea, The Bay of Bebgal and the Indian Ocean. For a country all of just 65,610 kilometers it hides some of the wondrous sights of the world, including eight UNESCO world heritage sights. Sri Lanka gained its independence from the British in 1972. But then it was in turmoil as the Liberation Tigers of Tamil Elam (LTTE) fought for a piece to call their own. But the Sri Lankan army roused them in 2009. The decades there after has seen Sri Lanka develop at a rapid speed. Already blest with the bounties of nature, the economic growth of the country has meant that it has a strong presence in the world economy today. We are aware that a week is not enough to show you the bounties of this beautiful island. But it is our endeavor that you at least savor some delights of Sri Lanka. The Sri Lanka tour package is comprised of all the popular destination the country has to offer. With SAARC visa norm applicable, a budget friendly tour price and a well detailed package, we will ensure that you are left wanting for more. An additional cost of Rs 2310/person (USD 35) would be applicable for entrance into: Madhu River Ride and Turtle Hatchery at Bentota, Dutch Museam and Maritime museam at Galle and National Museam, national Zoo and Gangaramaya Temple in Colombo. Rates are subject to change in case of any changes in Govt. taxes etc. The Beaches of Srilanka are stunning. The clear water was so refreshing the golden sand under your feet so soft. Thank You !!! !